Panâh may not be a household name, but its clients will certainly ring some bells. 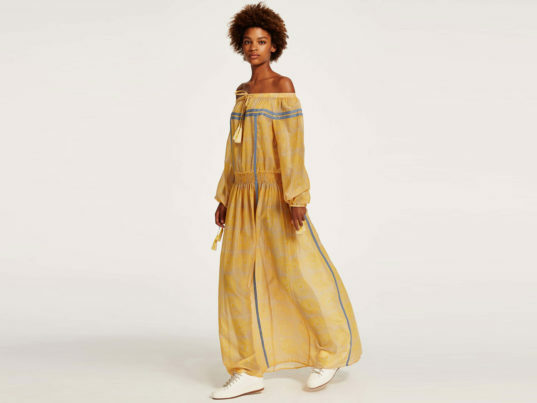 Founded by husband-and-wife duo Morteza Saifi and Evgeniya Khromina, the Nairobi-based fashion production house provides consulting, sourcing, and manufacturing services for a host of East African and international labels, including such ethical stalwarts as EDUN, Suno, and Lemlem. And like the labels it serves, Panâh has a social mission: to employ and better the lives of underprivileged youth and women in Kenya. The firm prides itself on the human story behind the production of clothing, particularly in the wake of tragedies like the collapse of Bangladesh's Rana Plaza building in 2013, the same year Panâh set up shop in the verdant heart of Jamhuri Park. Ecouterre spoke to Khromina about the company's genesis, how Panâh supports the wellbeing of its workers, and why the fashion industry should turn its eyes to East Africa. How did you and Morteza Saifi decide to found Panah? My husband has spent over 20 years in fashion industry in New York City. After Parsons School of Design, he freelanced for large corporations. Later in 2000, he launched his eponymous brand as an avant-garde designer and received notability for his designs and fashion shows. Morteza then joined the Camuto Group, where he spent 10 years building a career as an executive creative director. All through these years, Morteza was involved in production and spent substantial time visiting factories around the world in countries like Italy, Spain, Brazil, and China. On the other hand, my own experience comes from teaching English as a Second Language that I greatly enjoyed but stopped to pursue my degree in business administration. When Morteza proposed this idea, I felt that the business of ethical fashion could be an amazing experience and great learning opportunity for both of us. This passion for making things and interest in how fashion industry can empower people behind the production lead us to founding Panâh. After initial research, Kenya caught our attention. Projects like the Ethical Fashion Initiative already had received great recognition among international designers and fashion community with their work in Kenya. While on our first visit to the East African region back in 2012, we visited Kenya and Tanzania to conduct research and feasibility study. Our observations indicated that Kenya is a robust growing economy with more ease of doing business compared to its neighbors and with a large pool of skilled workforce. We decided on Kenya being the right environment for starting the company. What are some of the ways that Panâh benefits its employees? Panâh pays a living wage to its employees, the majority of whom are women and single mothers who strive to educate their children and support their families through income earned at Panâh.? We provide safe and comfortable work environment.? Breakfast and lunch are served daily for all employees at company cost. Can you describe some of the sustainable processes you employ? Panâh adheres to principles of lean manufacturing to produce better quality and reduce waste.? We use Juki’s eco-friendly [and resource- and energy-saving] equipment in the factory. We harvest rainwater for factory use, and we collaborate with local women’s and youth groups to recycle textile and paper waste. What are you most proud of about Panâh? Panâh’s business model is what makes us proud the most as we decisively set out to establish a for-profit socially responsible business in pioneering production of fashion products in East Africa. One side of it is financial sustainability, as what happens many times is when the donor organization is gone, the whole project falls apart. On the other side, we felt that Kenya as country with large talented pool of tailors can definitely manage the challenge and deliver international standards quality goods. So far we never looked back the decision we made.